It takes a perfect storm to make a great album – an audacious mix of tension and release, passion and calm, love and violence. Hallmarks associated with all true forces of nature, these mighty attributes were exactly what Little Big Town had in their corner as they blew into the studio in for the whirlwind recording session that produced their strongest work yet, their aptly titled fifth album, Tornado. LBT didn’t set out to break any land speed records in the studio. However, considering that the majority of Tornado took just seven days to record, that’s exactly what the recording process felt like to Karen Fairchild, Kimberly Schlapman, Phillip Sweet and Jimi Westbrook, a group famous for their trademark four-part harmonies. Motored by the laid-back summer anthem, “Pontoon,” Tornado reaches new and uncharted waters for the group as they make a course for the swamp-filled delta. Working with Producer Jay Joyce (Eric Church, The Wallflowers) for the first time, there’s an immediate difference to the sonic textures of this project when compared to any of LBT’s earlier works. The first track, “Pavement Ends,” rips open with organic, almost lo-fi guitar distortion, as a banjo plucks away to the rockabilly-inspired tune. Sounding like a backwoods party somewhere off of Mississippi’s famed Highway 55, LBT’s chemistry is contagious as they sing in harmony, You can get you a buzz/Blame it on the radio, through the lively chorus. One of the most striking elements to Little Big Town’s harmonies is that even though their voices are intertwined, each member continually makes their presence felt through their unique styles. On “Front Porch Thing,” a bluesy trip through the everglades with a heavy stomp, the individual inflections between members Jimi Westbrook and Phillip Sweet are captivating. Later in the record, on the urgent, good-timin’ party song “On Fire Tonight,” Kimberly Schlapman and Karen Fairchild go high/low, each with a distinctive delivery. Add them all together and there’s a compelling interaction that seems to take on a life of its own. The reflective, acoustic-based “Can’t Go Back” offers sublime harmonies that wrap around the listener while subtle shifts of phrase and isolated vocal solos add to the exquisite depth. Members of Little Big Town co-wrote five of the album’s 11 songs, and the collection maintains a smart balance of tempo and emotion. The anguished, “Your Side of the Bed,” details classic country lonesomeness with lines like, Are you sleeping with your own regret on your side of the bed? Next to lighter-themed material like the group’s first #1 hit, the groove-heavy “Pontoon,” the turmoil in these songs is even more potent. On the minor key “Leaving In Your Eyes,” lyrics such as, If you just let one tear fall down, that might tell me why you’re hangin’ ‘round, resonate with feeling before moving into a Fleetwood Mac-tinged chorus. One of the most powerful songs on the record is the title track, “Tornado.” Opening to a spaghetti western whistle and cowboy guitar, Karen Fairchild handles the lead with grit and strength. I’m a tornado looking for a man to break, she sings, dictating every movement with a sultry voice looking for revenge. Her control here is so masterful that the musical backdrop is not just supporting her, but actually following her every lead. Jay Joyce’s atmospheric production does wonders to build the uneasy tension. 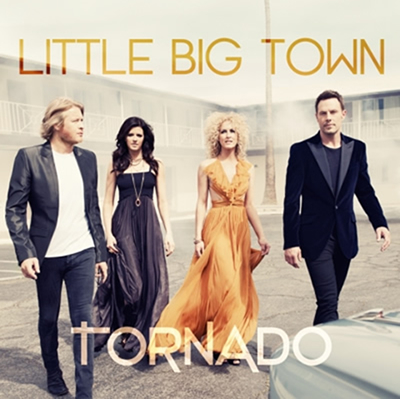 On Tornado, Little Big Town has created an album unlike any of their previous works. Though their unique and compelling harmonies remain the group’s calling card, there’s an urgency and energy that runs through it in a new way. Songs like the blues-rock “Self Made,” full of attitude and fuzzy guitar, have a live feel that’s a welcome component. This is indeed a different sounding record, but Little Big Town’s daring pays off with a gripping set that distinguishes and identifies the band on their most ambitious album yet.